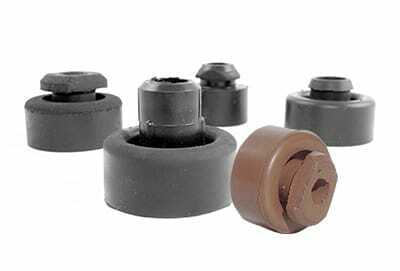 Qualiform is a top manufacturer of custom rubber grommets. We work with OEM’s and aftermarket manufacturers to assist in the development of custom grommets in a variety of rubber and elastomeric materials. We produce a full range of sizes and shapes in natural and synthetic rubber. We can source custom rubber and elastomeric compounds to meet the requirements of any grommet application. Custom grommet materials include Viton® grommets, rubber grommets, natural rubber grommets, EPDM grommets, and many more. We also offer custom compounds developed for your specific application. Contact our knowledgeable engineering staff for additional information on our rubber grommet manufacturing capabilities. Custom rubber grommet molding, Viton grommets, rubber grommets, natural rubber grommets, EPDM grommets, custom compound rubber molding, rubber grommet manufacturer.